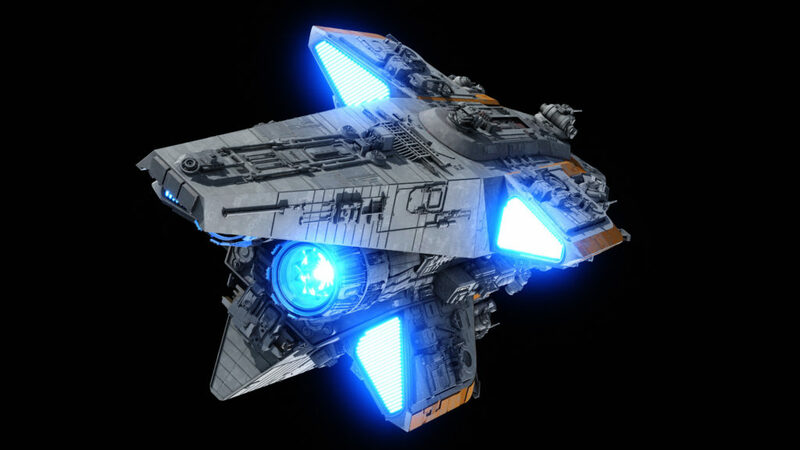 How many fighters do you think this could hold, and are the single barrelled, forward facing weapons turbo lasers, and the smaller quad barrel weapons laser blasters?? 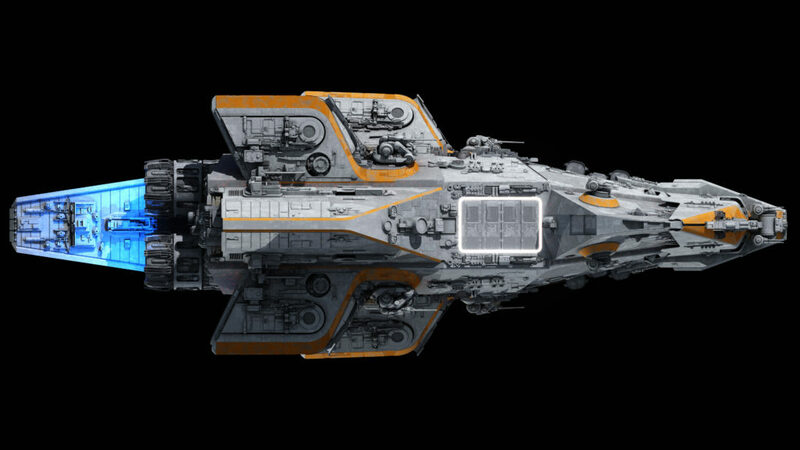 It does remind me of the MCRN Donnager from the Expanse, looks amazing! 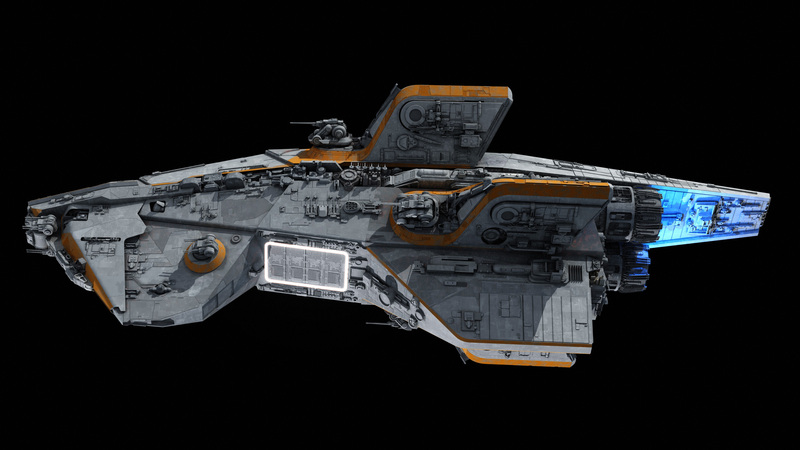 Seems like this outguns the Kontos in a slightly smaller package, and she has landing capability to boot. A side by side would be interesting. 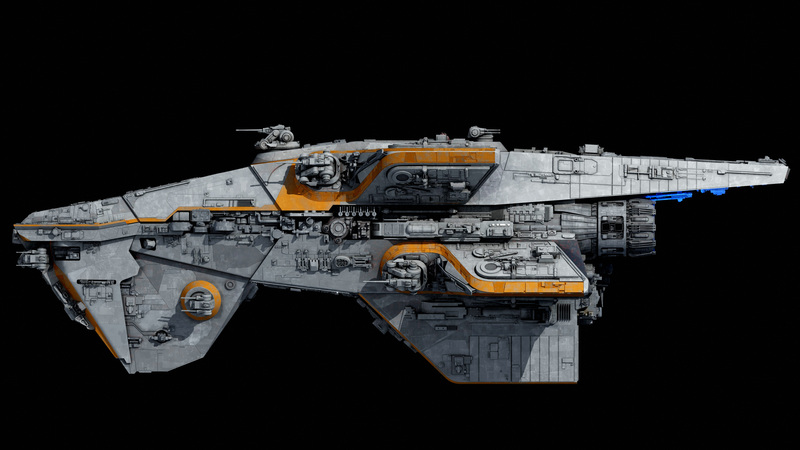 I suppose the Kontos would have more sensory/noncombat capability, perhaps less cramped quarters or simply more crew, in terms of tradeoffs. Would the Teroch give up anything in terms of armor/shields for her weapons-heavy loadout? She probably doesn’t have to give up armour, though she might not have the power for shields commensurate with her size, given the power draw of those big guns. She also has no visible point defences, not that a few light turbolasers would actually draw much power. Do I spy a single missile launch tube on each side of the neck? Are those docking collars amidship? 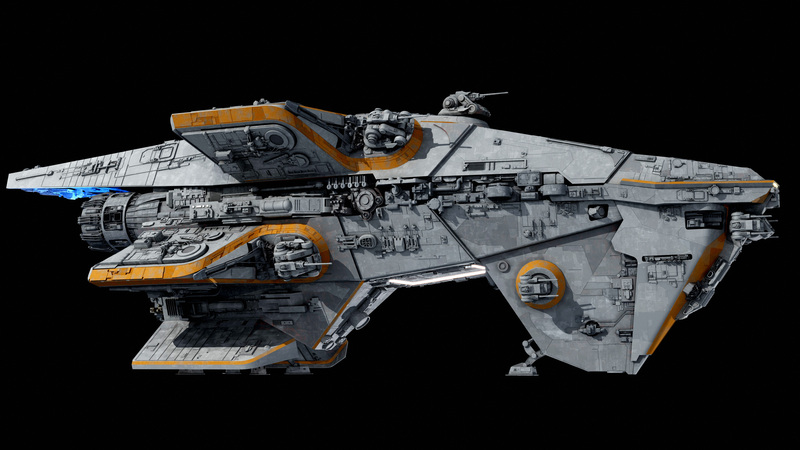 It’s 399 m in length as stated in the description, so size-wise it is in the Nebulon B-class/Arquitens-class range. 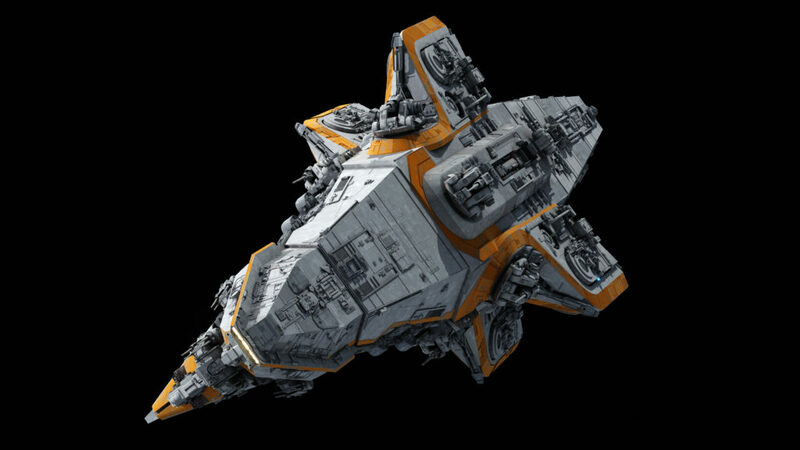 This is a Mandalorian ship, Mandalorians do not need backwards firing weapons because they never retreat or drag out a battle. 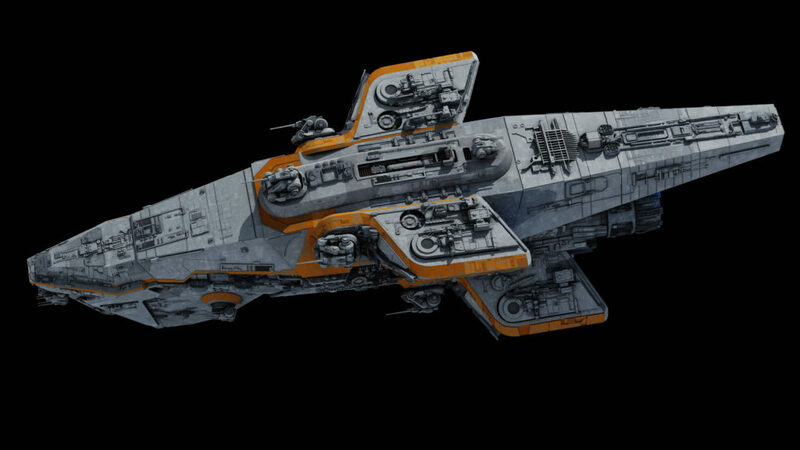 They either destroy their adversary with one frontal attack or by circling them while dishing out broadsides. Nebulon I thought was 300m? The length almost doesn’t matter, because it has insanely low volume. Indeed Neb b is 300m, Arquitens 325m which is the lower end range of this “type”. I didn’t want to place it somewhere in the ballpark of the Strike Cruiser (450m) or similar vessels but SW is notoriously inconsistent with this criteria anyways despite having an actual category system which uses length as a primary parameter. I’ve just realised how predatory this looks from above, like some beautiful cross between a dragonfly and an artillery battery. From below, the shape of the neck and head remind me of Serenity. Another reason to love the design. Would this be comparable to the Velox, which is the same length? This looks beefier, so more volume for generator(s)? You also mention that it has capacitors, which is why it has the lower-end HTL, whilst the Velox is MTL as main armament? Velox is about the same length but considerably less volume. Faster but much less space internally for capacitor and generator. 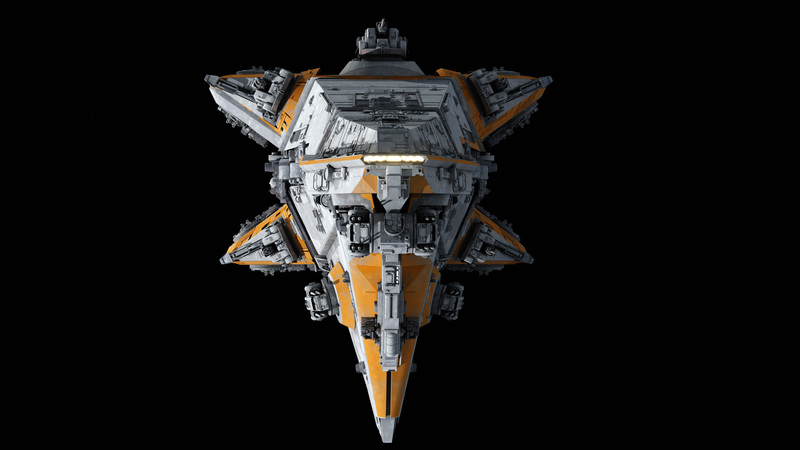 Ah yes, the very Mandalorian blocky-yet-sharp aesthetic! By the way Fractal, any updates on that controversial Imperial commission with the warhead ring of doom? That’s currently paused for logistical reasons. I imagine it will restart eventually when the commissioner is ready again. Holy damn, this came out of nowhere. 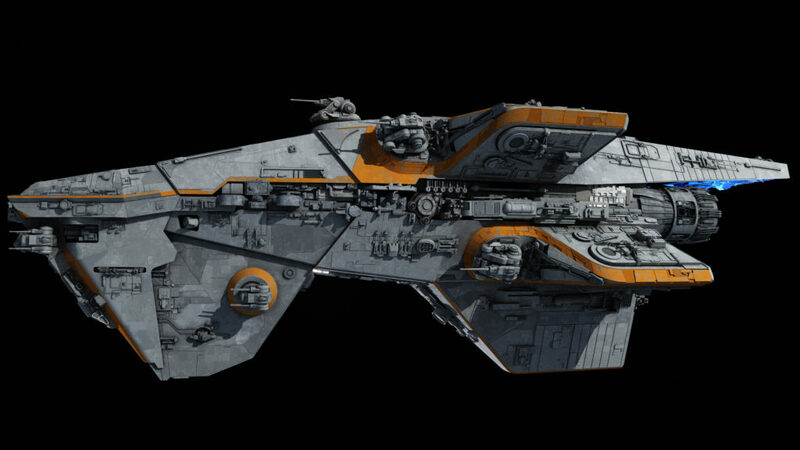 That is an awesome ship. Oh this one is just B-E-A-U-TIFUL. Everything about it’s simply fantastic and it still doesn’t fall out of place in universe. 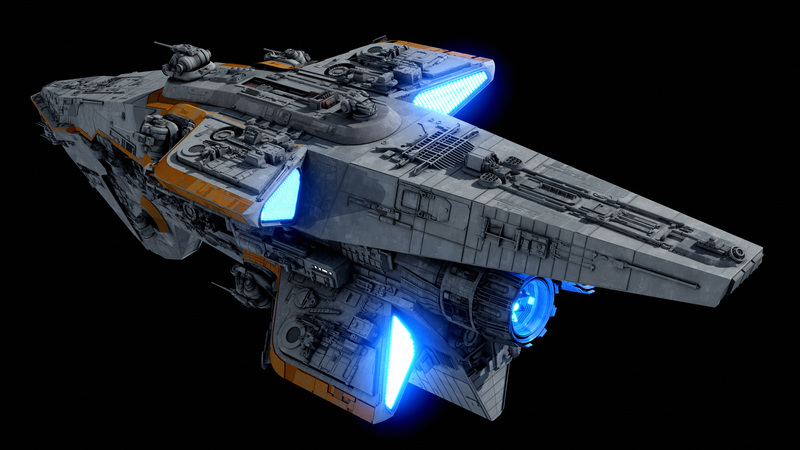 Seriously why aren’t you doing official ships for Disney again? 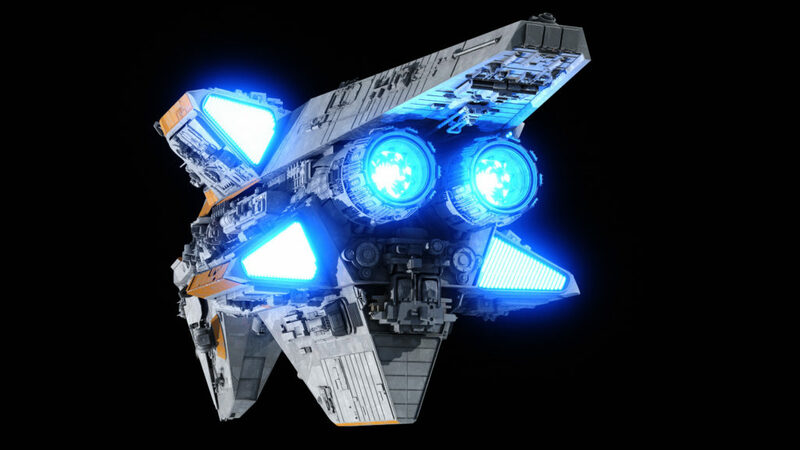 But more importantly that is an EPIC ship! Truly a spectacle of your design brilliance! I rather like this ship. It might just make it’s way into my Edge of the Empire campaign. I do see some design similarities with the Kandosii-Battleship which helps selling that this vessel is indeed of Mandalorian origin. Is it a total fanon design or has it an actual basis in extended (Legends)-canon just without any pictures like the Praetor I and the Procurator? Total fanon. Praetor had references though. Something that I hope becomes rectified at some point. Possibly, as some sort of mandalorian-crew going all ‘have blaster, will travel’ tv show? 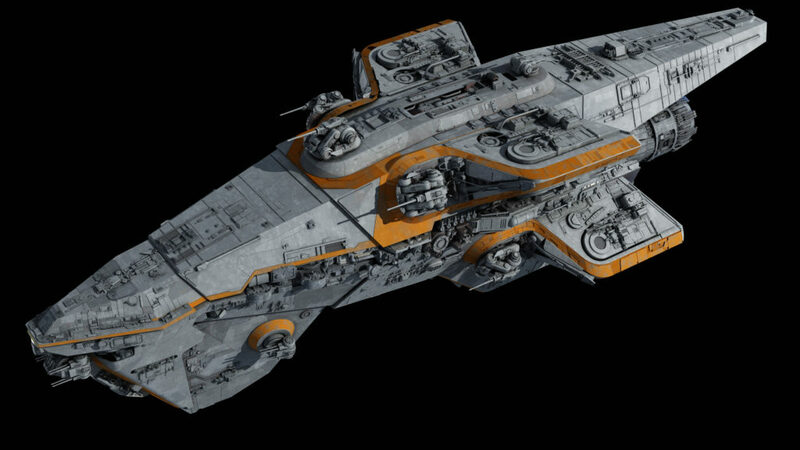 Very cool, are the single canons smaller than the HTLs on the Vindicator/Dreadnaught? 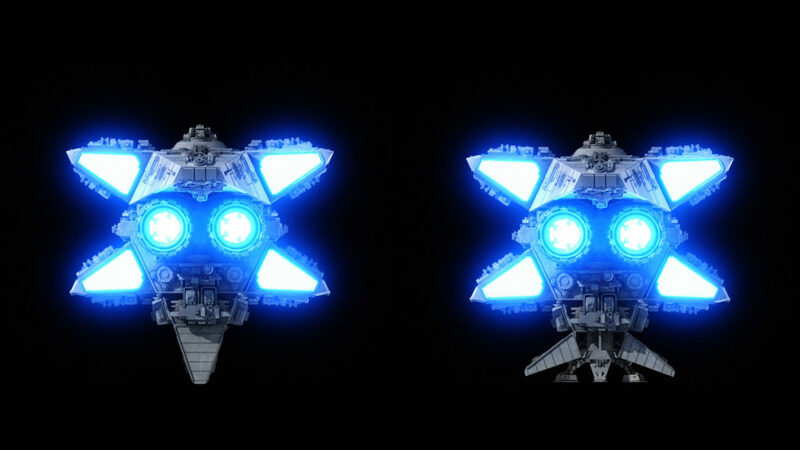 I like seeing when you roll out new gun assets (like the over under turrets of the lightskipper – those are just laser canons not light turbos right?). Also love how the bottom bit splits for the landing legs. Anyway I hope the commissioner will share their backstory detail for this. 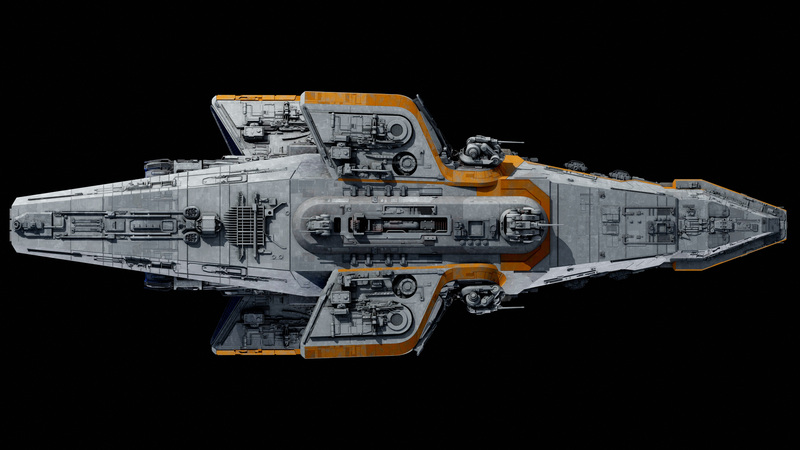 The idea was for a plausibly OT ship that would be a raider or similar vessel. The basic concept I developed from that is similar to what I back-calculated for the Kandosii – point the ship at a target, don’t stop until the target’s dead. Second passes and fights where it’s running away not optimized for, so pretty much dead blind arc except for an MTL to dissuade really fast corvettes. I feel like this is very Mandalorian in nature. Raider but not really skirmisher, if that makes sense. 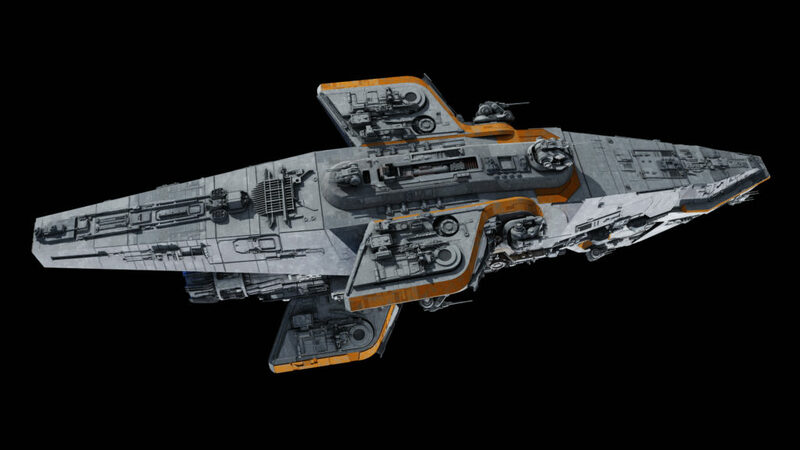 That makes a lot of sense, for a Mandalorian ship. 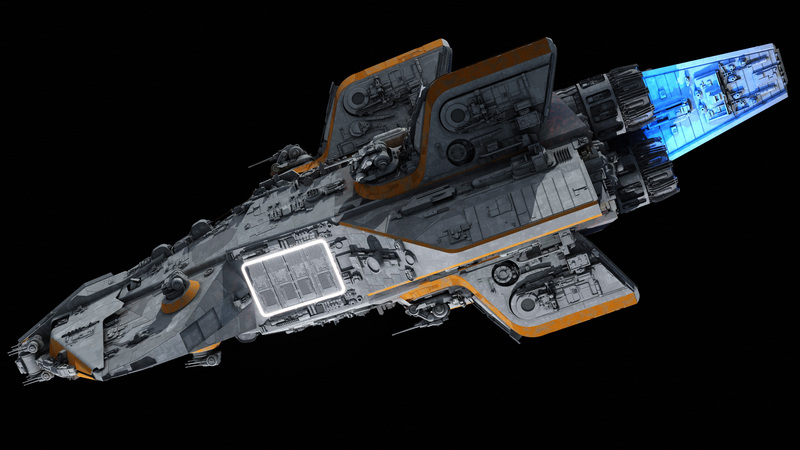 I can see this ship being used in packs in raids, just sweeping away targets on the first pass, leaving nothing but wreckage behind it. 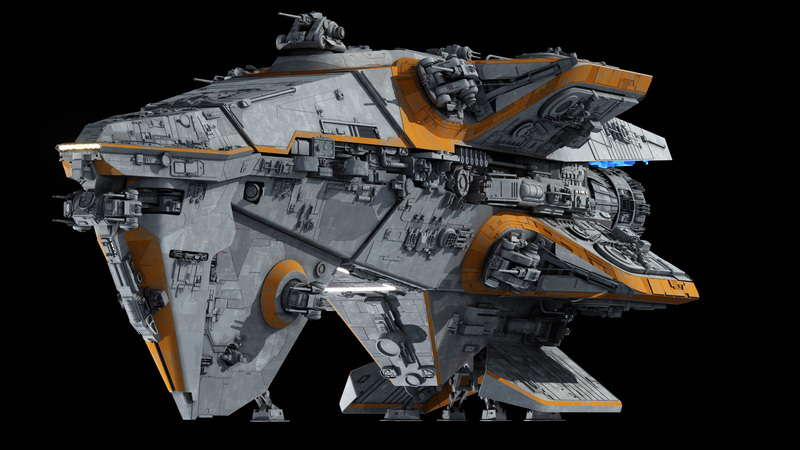 I wonder if this was commissioned by the same person that asked for the Mandalorian dropship. 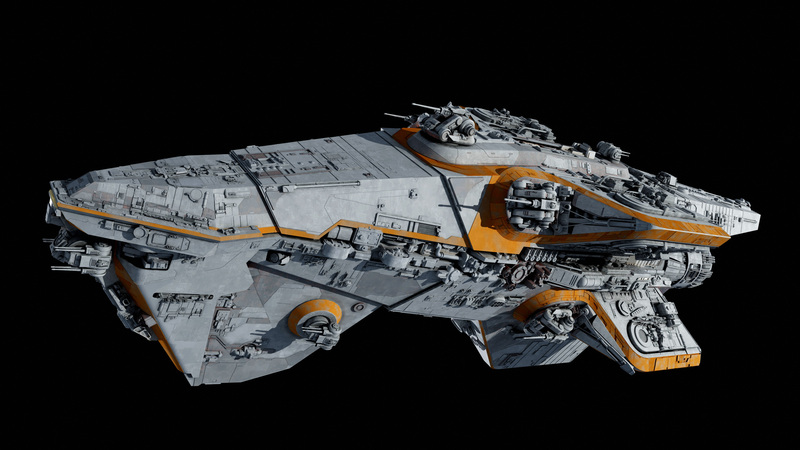 Is that a hangar bay underneath? This is really cool, I like the difference between this and Imperial designs. 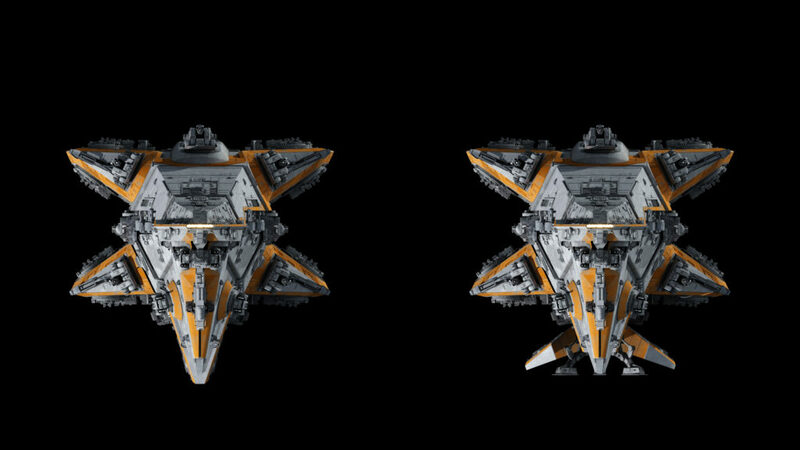 Are the large turrets mounting a single turbolaser HTL mounts? If so, what output? 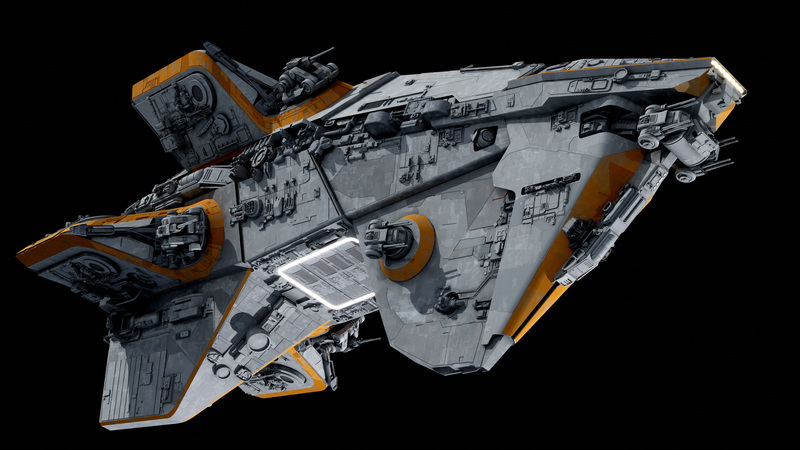 At first I thought that the fact that this ship has just the one battery pointing back was a design flaw, but then I remembered it’s supposed to be a Mandalorian design. Of course the entire thing would be designed with the offense in mind and not a single thought to retreat. AzureOwl gets it. Everyone, be like AzureOwl. Yeah! Nobody likes a hut’uun!